Numerous parents can attest to pinning down the toddler in an attempt to have them brush their teeth. It is a good thing to ensure that oral healthcare results in healthy baby teeth. Even though they eventually fall off, baby teeth are important for function and in guiding the permanent teeth into their positions. Your children should brush with a proper toothbrush as soon as the first tooth appears to prevent oral health problems. 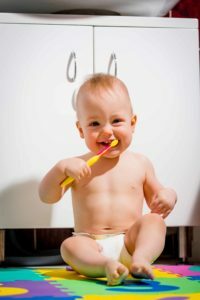 Tooth brushing time should be made fun to ensure that baby complies with brushing their teeth at least twice every day. Kid toothpaste that contains fluoride should be used for brushing. While you should brush twice a day, doing it before bed is most important, because while your tot is lying (generally) still, bacteria have a chance to grow undisturbed. And any sugar left in the mouth, from milk or food, gives bacteria an even better environment in which to grow.